The new Mini coupe's sporty looks aim to widen the brand's appeal. MUNICH -- Mini has released details of a concept for a new coupe that could expand the brands lineup to five models. 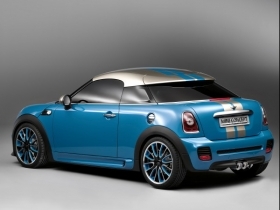 Mini will show the coupe concept at the Frankfurt auto show next month. The BMW-owned brand aims to bring the coupe to market in two to three years as a rival to the Audi TT and Peugeot's new RCZ. Mini, which this month celebrates its 50th anniversary, says the two-seat concept is designed to be the most dynamic and agile Mini ever. The coupes roof is made of aluminum and the concepts sleek looks have been achieved by lowering the roofline compared with the standard Mini hatchback. Because of its lighter roof, the coupe weighs about 100kg less than the standard Mini. The front-wheel-drive concept is powered by Minis most powerful engine, a 1.6-liter turbocharged powerplant found in the carmaker's high-performance models from tuning division John Cooper Works. The engine has CO2 emissions of 165g/km. The coupe will join the hatchback, convertible and Clubman wagon versions already on sale and a crossover model in the final stages of development.